What is Neuromarketing and How Does it Help E-commerce Companies Increase Their Visitor-to-Customer Ratio? 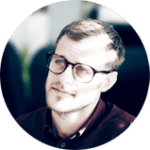 Consumer Behaviour » What is Neuromarketing and How Does it Help E-commerce Companies Increase Their Visitor-to-Customer Ratio? One of Christopher Nolan’s most overlooked movies is “The Prestige” – it is about a rivalry between two stage magicians. As is the case with most of great movies, it has a killer opening monologue. 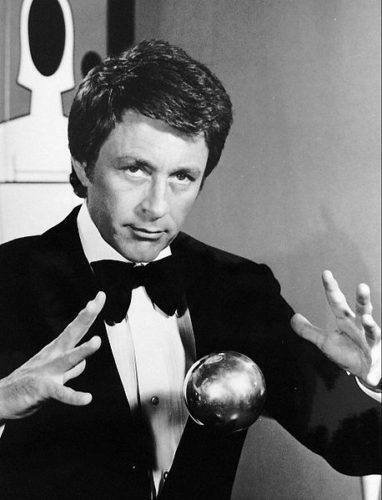 The speech is about the composition of magic tricks. I believe that building a successful e-commerce website is one hell of a trick, so let’s see whether the recipe from the movie is worth mentioning in this context. “The Pledge,” in the trick of building a successful e-commerce business (let’s just call it an e-trick from now on to simplify things) is the website. Nowadays creating a website doesn’t seem like a big deal – anyone can do it. I guess, “The Turn” for a website is to acquire traffic. Among the thousands of functioning websites made every day, there are only a limited number that will receive enough traffic to produce meaningful revenue. Exactly! Generating traffic to your e-commerce website is nothing. The trick is to make them buy from you! That is where the real magic needs to be applied to have a good conversion rate. Except, how in the world do you pull off this e-trick to get decent sales? Our advice – learn some basic neuromarketing principles and develop strategies to work with typical consumer behaviour. How Important is Conversion Rate Optimization for e-Commerce? As you have most likely realized, the problem with some e-commerce businesses is that people just won’t buy from them. The website is all set and done: the ad campaign on Facebook, or elsewhere delivers traffic to it, like a well-oiled machine. It is good, but not good enough. The fact that your website receives plenty of traffic does not mean that you will eventually produce a decent revenue as only percentage of visitors will convert to customers in the end. The goal of Conversion Rate Optimization (CRO) is to take specific action, that will ultimately to generate more sales. Increase in all qualified conversions greatly improves sales growth, and visitor-to-customer conversion is not an exception. As we can see from Google trends, the phrase “conversion rate optimization” is now Googled more than ever. Most successful ventures realise that this is important and it brings some benefits. 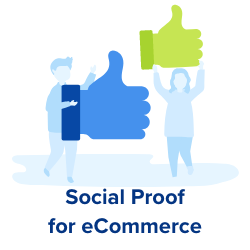 It is also has to be closely connected with the fact that only 22% of e-commerce businesses are satisfied with their conversion rate, according to the study by Econsultancy. There are plenty of theories about how to improve the conversion rate for e-commerce websites. Some of them work just fine while others are almost useless. For this reason we see a great potential in neuroscience, including neuromarketing, as well as in consumer psychology when it comes to CRO. That means that the question is not whether we should use neuromarketing to boost conversion rates and, subsequently, sales. The question is how to use all these “brain studies” to increase conversions. We need to know out what neuromarketing is and in what ways it should be utilized. 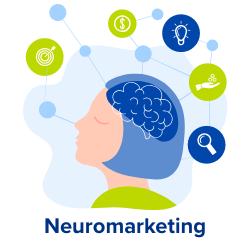 Neuromarketing is the formal study of the brain’s responses to advertising and branding, and the adjustment of those messages based on feedback to elicit even better responses. There are dozens of other definitions of neuromarketing. They all come down to the following: it is a type of technology that is used to measure and study brain activity to see a subject’s response to a stimulus. The concept is still in the process of development, but it pretty much comes down to studying non-conscious processing of information in consumers’ brains. You cannot deny that looking at certain brain patterns would be more useful than traditional surveys, for instance. People do not always realise what they do and don’t like. Moreover, they are not always going to tell you the truth about their preferences. Skeptics claim that the direct connection between brain-pattern responses and purchasing behaviour is yet to be proven. Removing the inevitable subjective bias that exists in traditional surveys helps to see the true picture and enables you to build a strategy according to the results. Speaking of biases, we are not at all rational. 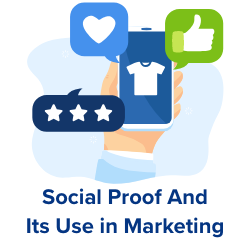 Neuromarketing helps e-commerce businesses to find the flaws in rational thinking that customers won’t ever stop making because they are human. Whilst the location of stores (offline to online) and the platform (Shopify, WooCommerce, Magento…) might change in the next few years, cognitive biases are hard-wired into your customers. It pays to understand these now, as they will help to inform your decisions for years to come! How Do Neuromarketing Principles Help Online Persuasion? Neuromarketing allows us to make lots of conclusions about people’s behavior. We cannot set aside people’s weaknesses in thinking when we speak of trying to convince them to make a purchase. So let’s dive deeper into the concept of cognitive biases. A cognitive bias is a limitation in objective thinking that is caused by the tendency of the human brain to perceive information through a filter of personal experience and preferences. The distortion tends to take place as our brain is unable to process information with unlimited speed. In other words, it is when we aren’t thinking in the most rational manner and we literally cannot help it. We all suffer from it, and it is extremely important to be aware of those biases if you are going to delve into the minds of your visitors. To put it simply the anchoring effect is the common human tendency to rely too heavily on the first piece of information offered (the “anchor”) when making decisions. 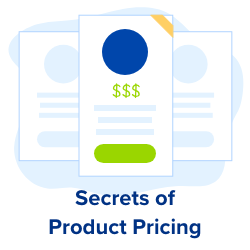 This is perhaps the most commonly used effect in e-commerce, yet many don’t know why they list the initial price before putting in the current discounted one. The thing is that people are impressed (both consciously and subconsciously) when the price is “decreased” as they mostly only pay attention to the initial figures. Practical use: When discounting an item, always display the original price alongside but clearly crossed out. On a practical level, potential customers have to see the higher price in order to understand how valuable your deal is. But more subtly than this, the higher price will serve as a reference point for all other prices the customer sees. This will have the effect of making all lower-priced items seem better value for money. The framing effect involves drawing different conclusions from the same information, depending on how that information is presented. You can either say “8 out of 10 people on the bus survived the crash” or “2 out of 10 people died”. See the difference? 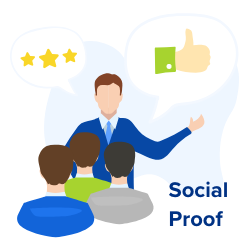 When applying this to e-commerce, you could present negative reviews in a way that makes them useful to the customer without completely obscuring them. Negative reviews (provided they aren’t the majority – if so you have bigger problems than your conversion rate) lend credibility to the reviewing feature, but can be placed less prominently than positive reviews. Perhaps the most brilliant way of presenting negative reviews was invented by the masterminds who made the poster seen below. Pay attention. 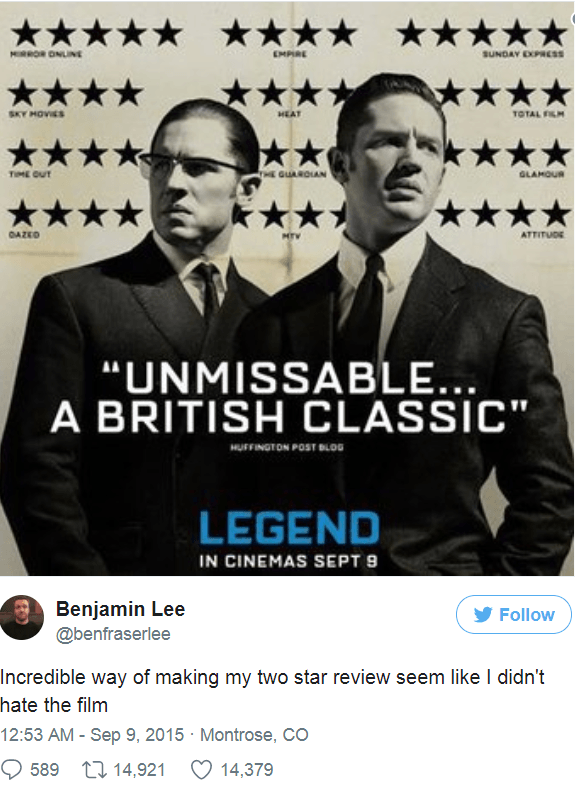 How many stars did “The Guardian” give the movie “Legend?” Even the critic who wrote the reviews applauded the guts of the movie’s marketers. Practical use: Make the positive reviews of the goods you sell more viewable than the negative ones. Highlight the advantages of the products you sell and don’t “over-emphasise” their disadvantages. When we talk about the “halo effect”, we refer to cognitive bias in which our overall impression of a person influences how we feel and think about his or her character. Let’s take a look at Brad Pitt. He is a handsome man, a good actor and has tons of charisma. He’s just has to be perfect in relationships, right? Well, we should ask Jennifer Aniston, whom he dumped a while ago, or Angelina Jolie who has recently divorced him. One great quality does not mean that the man is great overall. This idea is also applied to e-commerce websites. Well-designed e-shops may make money selling overpriced goods with terrible shipping fees while you’re still left with empty pockets. If your website has a design that looks like the one that was deliberately made by Angelfire to highlight all the mistakes web designers are capable of, it will not be a credible site, people just won’t buy. They will close the tab and never come back. Practical use: Make your e-commerce business website sharp and up-to-date to gain more credibility and make people stay. Potential visitors may very well convert into buyers and contribute to your revenue. These are just several examples of psychological biases that are implied in e-commerce. Progressively more biases are being discovered with the development of brain study technologies. We at Convertize have helped e-commerce businesses improve their conversion rate for almost a decade now. We implement all kinds of persuasion tactics and neuromarketing principles, including consumers’ cognitive biases, to improve out clients’ conversion rates. 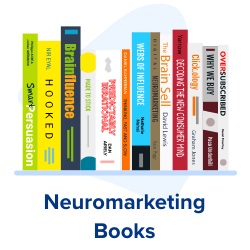 Furthermore, customers using our AB testing and Persuasive Notifications platform have access to a library of 250 tactics: these are practical, actionable tips based on our neuromarketing expertise. Want to harness neuromarketing principles on your website? 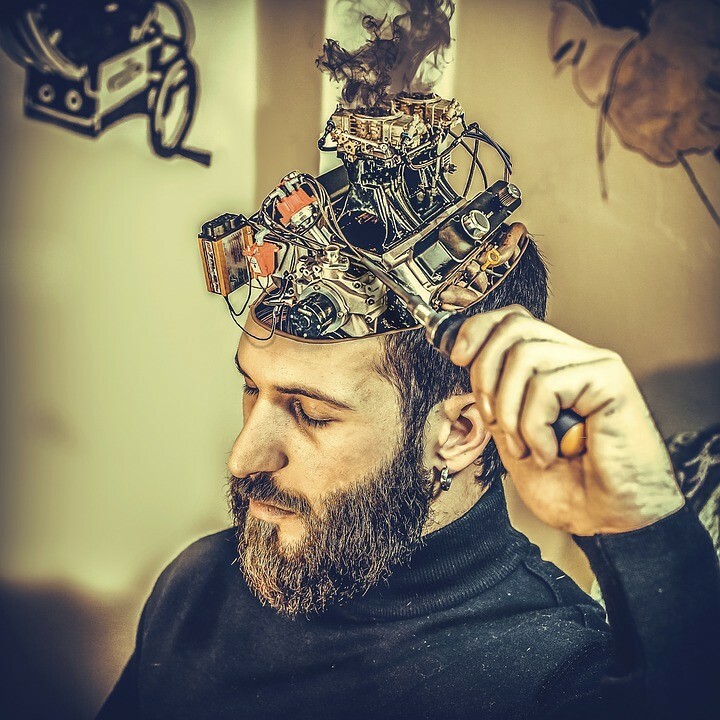 You can read more about neuromarketing on our blog or visit our tactics pages for 250+ conversion techniques based on neuromarketing principles then implement them on your website and AB test in minutes with Convertize SmartEditor™. Application of basic and advanced psychological principles has become a must for e-commerce websites unless they want to drown in the massive waves of other new pre-existing online shops. Neuromarketing studies how the human mind works and the results of these studies help to persuade people. Please keep in mind, that respectable businesses should never blatantly manipulate potential customers and website visitors. However, reasonable use of cognitive biases can improve conversion rates, make businesses grow and increase revenue.